Good morning polished world! How are you all doing today? Happy Mother's Day to all the mom's out there! Especially mine!! It's going to be some pretty cruddy weather around here today, so I think that my momma and I are going to stay in and lounge around. Sounds like an amazing day. 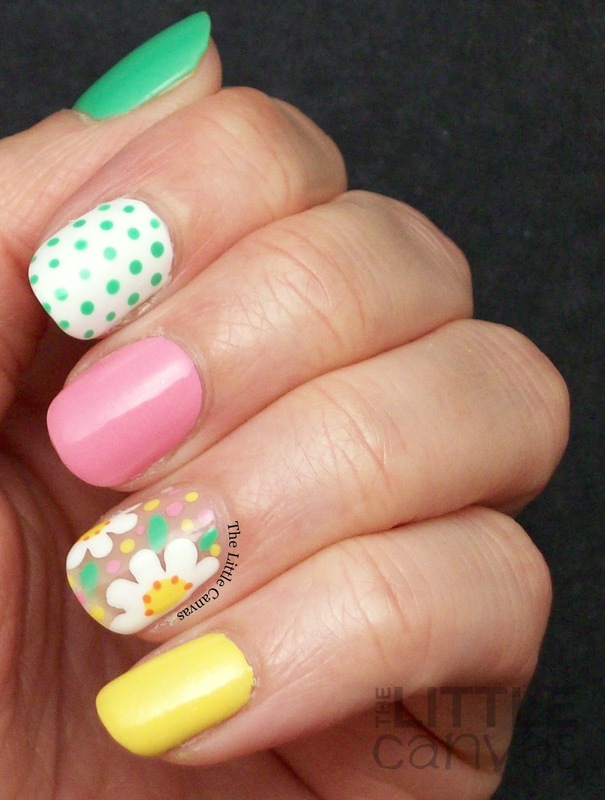 Today's manicure is a super spring floral manicure inspired by Bad Girl Nails on Instagram. 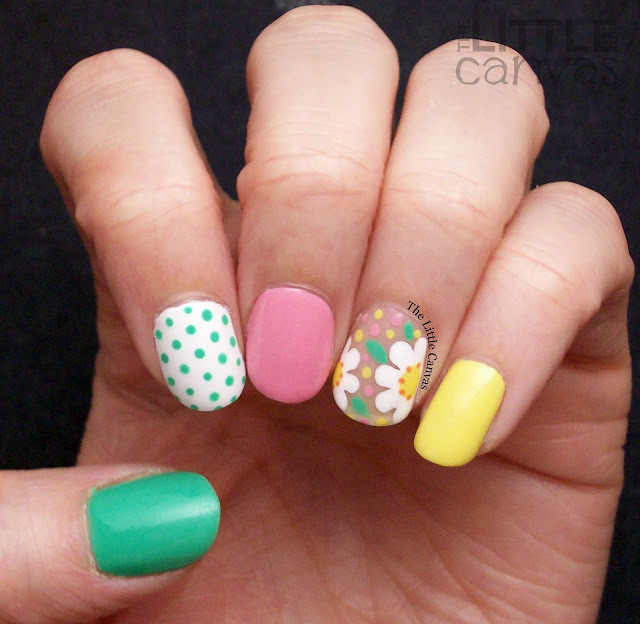 When the negative space manicures first started to become big, I wasn't a huge fan of them. I figured they were going to look awful on my nails so for the longest time I avoided trying them for myself. After doing a couple, I started to like them, and after this design I'm in love. Perfect manicure for Mother's Day....right? I think so because when I think of Mother's Day, I think of flowers. This design is super easy to re-create. I started off with my clear base coat. Since my nail seems to be peeling a little bit, I added a coat of FingerPaints Ridge Filler which is kind of a creamy beige color. It's super sheer, but when it goes on the nail, it clouds it up a little bit so it's not as obvious that the nail is naked. That sentence made sense in my head, but as I read it over it doesn't. Oh well. When that was dry, with a dotting tool, I added the flowers and all the different details. I topped it off with my top coat and had my nailed nail design. I find when I do naked nail designs, the polish dries super fast for the art. Maybe because it doesn't have two other layers to go through that is still in the process of drying? Regardless it's great, and the art doesn't smudge. First time ever using this Orly polish! Orly Melodious Utopia was part of the Hope and Freedom Fest collection years and years ago. Notice that it is in the old bottle. I actually think this is the last collection they did before they switched their bottles to the new black cap and black label. This polish is a yellow with pink shimmer throughout. I couldn't for the life of me get it to photograph true to color, but you should see this polish in daylight. So pretty with that subtle pink shimmer. It really tied the whole manicure together well with that pink nail. Trying a new bottle shot! Sarah from 25 Sweet Pea told me to try something different. I jumped out of my comfort zone and I'm kind of liking it. 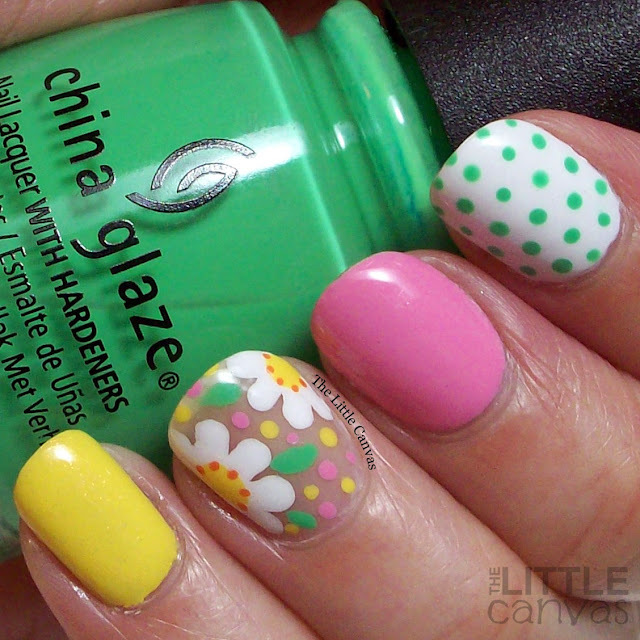 The color I'm holding here is Treble Maker by China Glaze. I used this polish on my thumb and for the leaves and dots. Two coats, great coverage. Love this one for water marbling too. It's such a fun green. I might need to see of HBBeauty Bar still sells it so I can grab some back ups. What do you think? 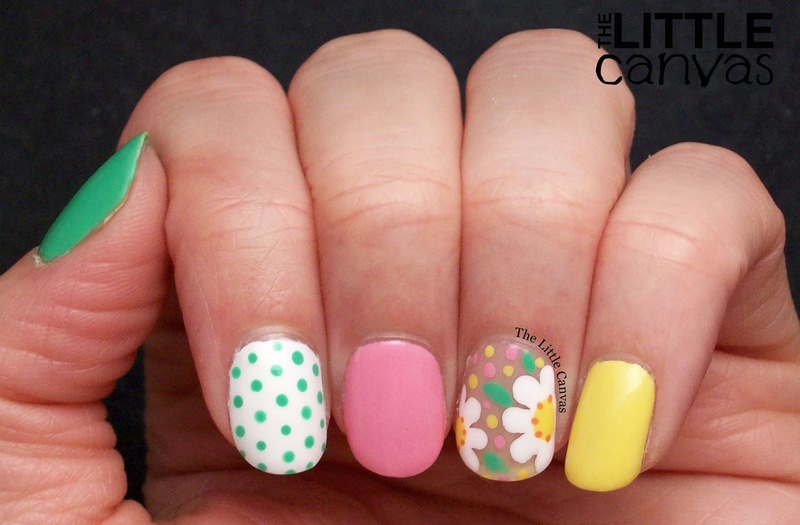 Fun manicure for Mother's Day? Do you enjoy the naked manicure look? Fan of the new bottle shot? If you are I might start phasing out some of my other photos. I hope that everyone has a great day, especially all the mother's out there!